The Global Volcanism Program has no activity reports for Caburgua-Huelemolle. The Global Volcanism Program has no Weekly Reports available for Caburgua-Huelemolle. The Global Volcanism Program has no Bulletin Reports available for Caburgua-Huelemolle. Four groups of basaltic cinder cones lie east of Lago Villarrica and NE of Villarrica volcano. The northernmost and southernmost groups, the Volcanes de Caburgua and Volcán Huelemolle, respectively, lie along the major regional Liquine-Ofqui fault zone. Volcanes de Caburgua lies at the south end of Lago Caburgua and consists of six early Holocene basaltic cinder cones. Lava flows from these cones contributed to blockage of river drainages that formed the lake. 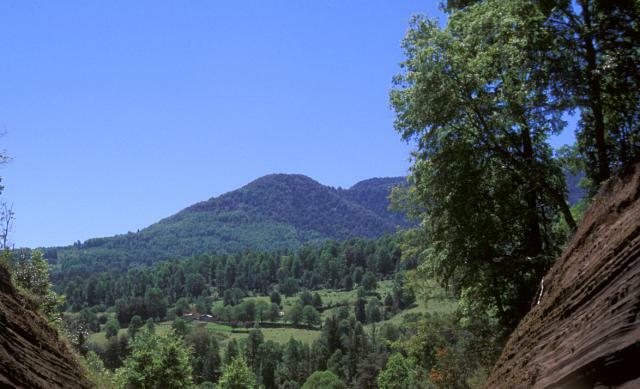 The southernmost group, Volcán Huelemolle, consists of three early Holocene basaltic cinder cones between the Liucura and Pucón (or Minetué) rivers. The two other cone groups, Cerro Redondo and Pichares, lie to the east of Caburgua and Huelemolle. Stratigraphic evidence indicates that these basaltic cone groups were active between about 6000 and 8000 years ago. Gardeweg M, Lara L, Matthews S, Polanco E, 2004. Pucon-Carburgua. IAVCEI Gen Assembly 2004 Pucon, Chile Field Trip Guide B3, 11 p.
Hickey-Vargas R, Moreno H, Lopez-Escobar L, Frey F A, 1989. Geochemical variations in Andean basaltic and silicic lavas from the Villarrica-Lanin volcanic chain (39.5° S): an evaluation of source heterogeneity, fractional crystallization and crustal assimilation. Contr Mineral Petr, 103: 361-386. Moreno H, 1994. (pers. comm.). Sun M, 2001. Geochemical variation among small eruptive centers in the central SVZ of the Andes : an evaluation of subduction, mantle and crustal influences. FIU Electronic Theses and Dissertations Paper 2005 (http://digitalcommons.fiu.edu/etd/2005). There is no Deformation History data available for Caburgua-Huelemolle. There is no Emissions History data available for Caburgua-Huelemolle. Four groups of basaltic cinder cones lie along the major regional N-S-trending Liquine-Ofqui fault zone, which trends parallel to Lake Caburgua (top). The northernmost group of cones lies at the southern end of Lake Caburgua and was the source of lava flows that dammed drainages, forming the lake. 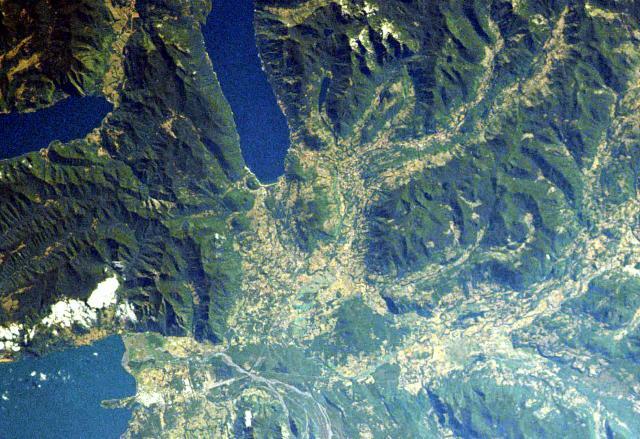 The southernmost group, Huelemolle, is the rounded forested area between two rivers at the bottom-center. Two other cone groups lie to the east of Caburgua and Huelemolle. Lake Villarrica is at the lower left, and Colico Lake is at the upper left. NASA Space Shuttle image ISS004-713-45, 2002 (http://eol.jsc.nasa.gov/). Forested Volcán Relicura, rising to the NW from near the Liucura Bridge, is part of four groups of basaltic cinder cones lying east of Lago Villarrica and NE of Villarrica volcano. The northernmost and southernmost groups, the Volcanes de Caburgua and Volcán Huelemolle, respectively, lie along the major regional Liquine-Ofqui fault zone. Lava flows from the half dozen cinder cones of the Volcanes de Caburgua blocked drainages, forming elongated Lago Caburgua. Photo by Jim Luhr, 2004 (Smithsonian Institution). Volcanologists on a field trip during the 2004 Chile IAVCEI conference examine an outcrop of the Caburgua-Huelemolle volcano group. 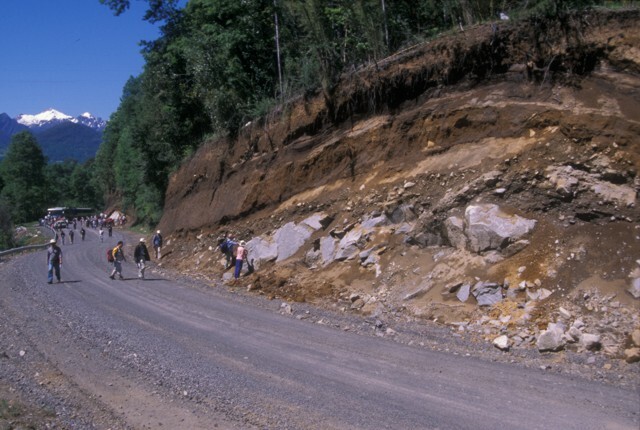 Miocene granodiorites at the base of the roadcut are overlain by postglacial pyroclastic deposits from basaltic cones of the Caburgua-Huelemolle group. There are no samples for Caburgua-Huelemolle in the Smithsonian's NMNH Department of Mineral Sciences Rock and Ore collection. Large Eruptions of Caburgua-Huelemolle Information about large Quaternary eruptions (VEI >= 4) is cataloged in the Large Magnitude Explosive Volcanic Eruptions (LaMEVE) database of the Volcano Global Risk Identification and Analysis Project (VOGRIPA).